The University of King’s College, one of Canada’s oldest universities, will examine its possible ties to slavery in the 18th and 19th centuries. The school announced on Monday it will be embarking on a scholarly inquiry into its past, and will be compiling original research from leading Canadian and U.S. scholars. The team of scholars will be headed by Dalhousie University history professor Jerry Bannister. They will look at direct and indirect links to slavery and the nature of those links. The University of King’s College was founded in Windsor, N.S., in 1789 by loyalists fleeing New York during the American Revolution. Originally founded in New York in 1754, the original King’s College changed its name to Columbia. Just last year, Columbia published its own research unearthing its own ties to slavery. Lahey said one of the project goals is to improve general knowledge about Nova Scotia’s history as a province, where slavery existed officially until 1834. “Like all scholarship its first and immediate goal is to help us better understand,” he said. 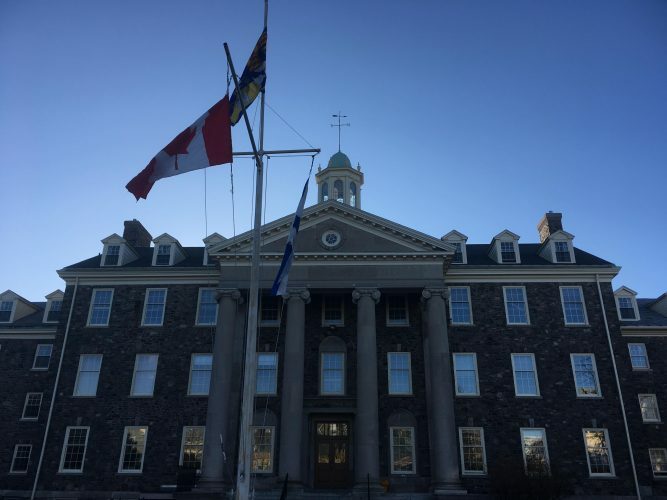 Last summer, Halifax activist El Jones published an article in the Halifax Examiner detailing a connection between King’s and slavery. She found the school benefited from funds made directly off of the slave trade in Barbados. Lahey said the article showed an inquiry was needed. “One important part of demonstrating that we are a welcoming university who wants strong relationships with people who belong to those communities, is to show that we are prepared to do this kind of analysis,” he said. For Julia-Simone Rutgers, a third-year student at King’s, analysis is not enough. “I think that it’s a very noble initiative to look into and acknowledge an institution’s history as a part of an act of healing, as a part of being responsible for diversity on campus,” she said. “But it’s time and energy and resources that (are) reflective and not proactive. Rutgers would like to see the Racialized Student Collective at King’s get a permanent space to meet, as well as more resources and funding. She would also like to see more scholarships made available to students of colour. However, since Lahey arrived in 2016, there hasn’t been much of a change. “We are not a diverse enough community, and that reflects our failure to be as inclusive and welcoming as we should be,” he said. An expert review panel will be headed by King’s professor Dorota Glowacka, Halifax lawyer Douglas Ruck, Halifax Regional Police Supt. Donald MacLean, and two student representatives chosen through the school’s student union. They will be in charge of evaluating the research papers before publication. The inquiry work for King’s is expected to be completed in early 2019. King’s neighbour, Dalhousie University, has been looking into Lord Dalhousie’s problematic views on race as a part of its bicentennial.